CJS welcomed a new member of staff today. AN brought her new puppy Bill to work this afternoon. He's a 16 week-old border collie, very handsome and canny too. 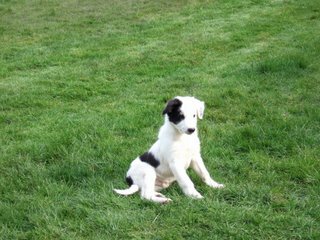 The resident office dogs welcomed him with open paws, Juno (boss dog) soon put him in his place, Maia (Juno's younger sister) thought it was great having a playmate but Cara (the wolfhound) couldn't be bothered and sauntered off to lie in the watery sunshine. So apologies to anyone who rang this afternoon and was put off by the squeaking and growling in the background.